The secret for perfect photos | Cosa Mi Metto??? As blogger, photography is a key parto of my job and of my daily life. I'm sure you know this. What you may didn't know is that often, what you see in a photo, isn't completely real. Very oftern to create a perfect shot, photographers use same little tips. A beautiful subject and a perfect light aren't enough in many cases. So what? You may need also the perfect location. But sometimes you can't walk around, move, wander and search until you'll find the perfect location. So what's the secret? A backdrop. A backdrop is what you see behind the subject. A large piece of cloth with something like buildings, countryside, an enchanted forest, a perfect wall.. or simply a wood table, marble or somethign like these for a flatlay. On Kate Backdrop you will find the best backdrops to helps your photos to be perfect. Browse through categories to find the perfect one for you. Choose from a lot of different kinds to recreate the situations you desire: do you want a cool backdrops party photography pictures? Maybe you're going to say "I Do" and you want same perfect memories of that day, so look at wedding photo backdrops set for pictures. 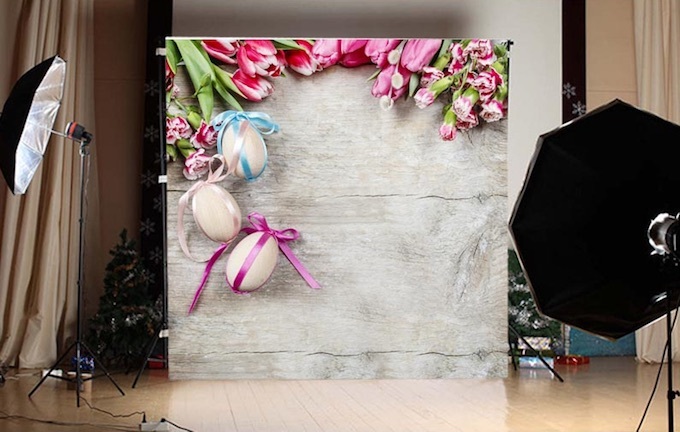 To make lovely pictures for this moment for example you can choose from Easter spring backdrops for photography. I'm pretty sure, from this moment you're going to shot the best photos of your life! Very interesting! The backdrop does play a big part in beautiful photos!